Welcome to Day 8 of my #100DaysofBulletJournalIdeas Project! The Reading Log in the form of a bookshelf blew up not long after I reposted this image on Instagram a couple years ago. I had seen it going viral in the Bullet Journal Junkies Facebook Group and found the earliest instance of it on Instagram and reposted it. That said, I don't know who truly originated the idea. The idea immediately took off and just about everyone fell in love with it as a visual reading log. Makes sense, it's super fun. You make the bookshelf and color in the books once you've read them. You can write the title on the book's spine if you'd like, I think that's what the majority of Bullet Journalists do. By now, I've seen so many iterations of it, it's incredible. Here's a simple search of "Bullet Journal Bookshelf" on Pinterest to gander at all the lovely ones out there. 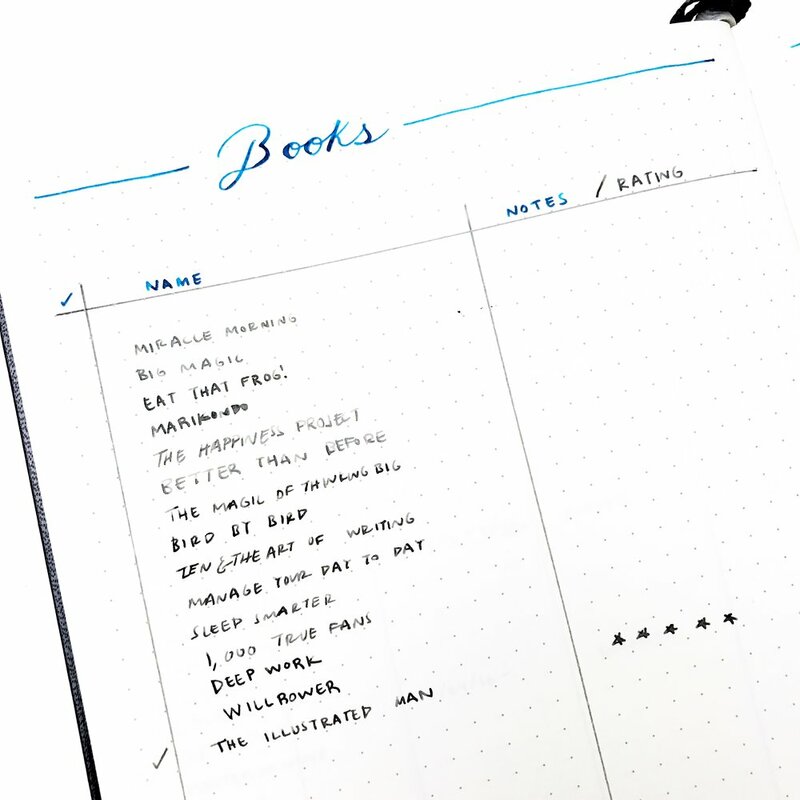 As Bullet Journalists, we love all things to do with notebooks, stationery, and all great things analog. Books are one of those simple pleasures that bring us great joy. When I'm immersed in a good book, I feel refreshed with words that spoke exactly to the things in my heart and mind. Here I added a column to check off when I read a book, a column for the title of the book, and a simple rating system. I had initially written 'notes' for the third column then realized that was not enough room, so changed it to a rating system. Looking at this collection now I realized that I managed to read a few of them! The reason I hadn't checked them off in this collection is because I go through my Bullet Journals pretty fast so by the time I finished them, I was already in a different Bullet Journal and didn't make a new Reading Log in the next one (that I remember) or make a note to remember to check them off in this notebook's collection (as mentioned as a possibility with Notebook Threading). That sometimes happens. The good news is that having written down the books I wanted to read more than likely helped me read them because by writing them down, I strengthened the memory and intention in my mind to read said book(s). Or in this case for the Illustrated Man, its stories. I loved this type of Reading Log because it helped me focus on one book and its chapters at a time. The true reward was in reading the chapter, but that extra little feeling of accomplishment that I tracked in my Bullet Journal was fun. For this month, I added floating shelves and called it The Reading Nook. The idea was to add the books I read each week and color them in, then I realized that I don't go through multiple books a week. I realized this would work better as a Quarterly Reading Log where I would add the books I read each quarter on their own shelf. I will likely tweak this a bit further. As mentioned before, this is an incredibly popular visual collection and it works! When I was in High School, I found myself taking P.E. one summer so that I would be able to choose an extra elective the following year instead of having to take P.E. during the school year. It was probably the most intense experience I had done up until that point in my life in terms of exercise. We ran once or twice a day at the hottest point of the day every single day of the week. We strength-trained, kept food logs, and got ridiculous shirt tans. I loved it, though. It strengthened my mind to push through the exhaustion of running to keep going, no matter how slowly despite the blazing sun at noon. I fell more deeply in love with running that summer and discovered a greater interest in health, nutrition, and all things wellbeing. I had always been known to eat pretty healthily, but that summer I took it upon myself to learn as much as I possibly could about health, so I turned to one of my favorite ways to learn: through reading. I read a few books on nutrition that summer with a vigorous schedule I set for myself each day. I would wake up at 5am, read x amount of pages for each book while taking notes, made breakfast, went for a long run, made lunch, relaxed and read or hung out with my friends, and then made dinner. There were also snacks interspersed somewhere along there. Having that goal of reading x amount of pages each day worked for me. Every day, I would read for a different amount of time but I always loved taking the time to read. Writing this out makes me happy because it helps me remember how much I grew that summer and how it has long since left an impression in my life and the choices I make in terms of my health. It also makes me remember how effective it was to have that goal in mind of reading x amount of pages. Moral of the story: By dividing the number of pages in a book into a certain amount of days, say a week or two, you can effectively set a goal to read a book within that time frame. This is a useful method if your goal is to read a book every week, or in the span or two weeks, or however your preference. All of these collections are useful because they double as methods to help you read more because they're engaging in some level. That's pretty much the whole deal with Bullet Journaling, right? You're actively engaged with it every step of the way and therefore more closely attuned with everything that goes in it and your goals. 1. If you want to read a book per week: Divide the number of pages in a book by 7 and then read that number of pages each day. You can read a bit in the morning and in the evening if that helps. This method also works for different time frames, such as biweekly, monthly, or however your preference. 2. If you're strapped for time: Read for 15 minutes a day. Everyone reads a page at a different rate, so the pages trick might end up taking you a longer time than you are able or willing to commit. But everyone can carve out and prioritize 15 minutes a day to read. Choose more or less time, tell yourself to read for at least one minute and I'm sure even you just read for one minute, you'll feel more accomplished for it. 3. Read at least one page: If you find yourself making excuses for whatever reason or find your mind distracted but you know you want to read, you intend to read, you want to pick up that book you've been meaning to read but putting off - then just pick up the book and read one page. Reread paragraphs if your mind wanders, just read at least one page. This is a trick I use to help me get past all the mental chatter when all I really want to do is to enjoy my book. 4. Think about your love of reading: What is it about reading that you enjoy? Once you've answered that question you'll have your own reasons that will fuel your passion for reading. Think about the last book that left an impression on you. Some people might say they don't like to read, but I truly believe that it's because they haven't found the right book or perhaps even the right method. 5. Read in a different way: Try listening to books if you haven't. Audible is a wonderful choice. I've read quite a few books this way. It's a marvelous experience listening to someone tell you a story. I highly recommend it if you haven't experienced it yet. The best is when you listen to an author narrate their own book, such as Big Magic by Elizabeth Gilbert. It's also a huge treat to listen to talented narrators read books, two of my recent favorites include Dark Matter and The Subtle Art of Not Giving A F*ck.